Definition: As a general rule this means ‘here in this document’. It can cause ambiguity as it can be unclear if you mean the whole of the document or only part of it, for example a specific section. TIP! : This is considered as legalese. Good modern drafting and legal writing follow principles including trying to reduce or eliminate legalese and replace this with plain English alternatives. To improve your legal writing try to replace ‘herein’ with something more specific: ‘in this document/contract/clause’ or ‘in clause x’. Example: The parties agree to the terms and conditions herein. 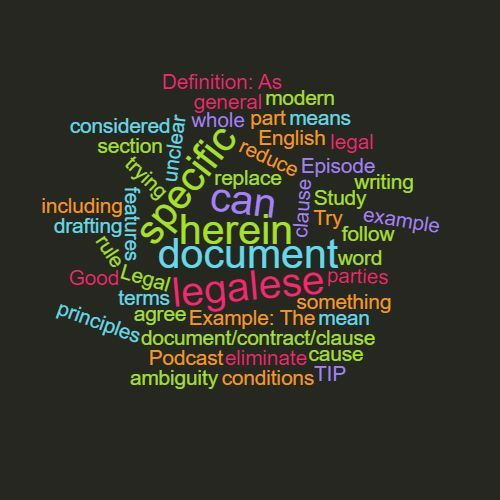 This word features in Episode 55 of the Study Legal English Podcast.